We are starting to build the 4.5 OSGeo-Live DVD and want to hear from all included projects, translators, packagers, users, testers or others who wish to help improve OSGeo-Live. 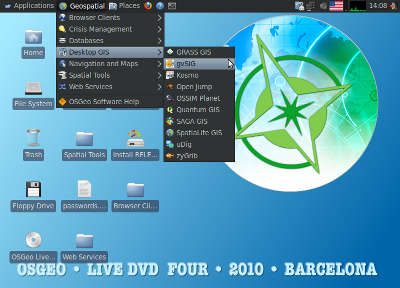 OSGeo-Live 4.5 will be released mid March 2011, ready for a number of big GeoSpatial conferences soon after. Focus on this next release will be on improved Quality and Translating documentation. Packaged projects - which version? Could each project please tell us which version is intended to be included. Status is maintained here. Understanding what will, or will not change helps us coordinate reviewers and testers. We will be building from the Xubuntu 10.04 base, which is the same as last release. If you have a established, stable project which you would like included on OSGeo-Live, then please talk to us about it. In order to ensure consistency and reduce disk space used, we ask that, where appropriate, examples use the common Natural Earth dataset, as explained here. We expect to have main pages, Project Overviews and possibly OGC Standard Overviews translated into multiple languages for this next release. People have already translated much of the documentation into German, Spanish, Italian, Japanese and Greek. Could all projects please update your English Project Overviews as soon as you can to give translators enough time to translate. Please contact us if you are able to help with translation, or would like to translate a new language. The process is described here. Half the packaged projects had Quick Starts written for the last release (4.0) and we'd like to see Quick Starts for all projects for the next release. One of our users has volunteered to review Quick Starts for usability and help projects capture screen grabs. This is a big job and we'd like to hear from anyone else who'd can help out. Again, could projects please update Quick Starts early to allow time for review and screen grabs. With ~ 50 applications to be packaged on the next OSGeo-Live, our core OSGeo-Live team have not had time to run all the Quickstart applications. We would really like some help. If you have very little experience with OSGeo software, then all the better, as you would be like a typical first time user of OSGeo-Live. Running this user testing is one of the best ways to become familiar with the breath of OSGeo Software available. If interested, please join the OSGeo List, and start running Quick Starts as soon as they have been completed by projects. The OGC have already written one page overviews for half the OGC standards and have committed to writing up the remaining standards for then next release. We will be calling on the standards community to help review these standards to ensure they are accurate, clear and understandable.